Review: This is a strategy map for CISCO. 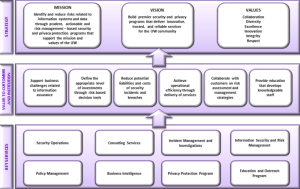 The vision of the company is to provide secure and reliable network programs to the customer. The mission and valued of the organization have also been comprehensively described. It can be seen that it is not a typical base 4 balance scorecard strategy map categorize into four perspective rather the Map represents CISCOs own strategy principles with objectives not integrated into single category having vision and services above and below respectively. Map looks reliable and despite of being a technology firm, not much technical terms have been used. Opportunities: Map can be used as a sample for technology related firms. Vision, mission and values have been unequivocally explained and it can be clearly understood what organization wants to achieve. Management of technology related companies can utilized this map as an example to devise a strategy which would help them achieve the desired targets. Result: The map is good overall and can be used a model, however objects are not clearly categorized. Too many objectives in single category which could be categorized makes the map bit difficult to understand at first. Apart from that, clear and explicit missions, values and vision makes the map suitable to follow.